The Census Bureau recently released the 2017 Survey of Construction where they look at the characteristics of new construction, both single-family and multifamily. 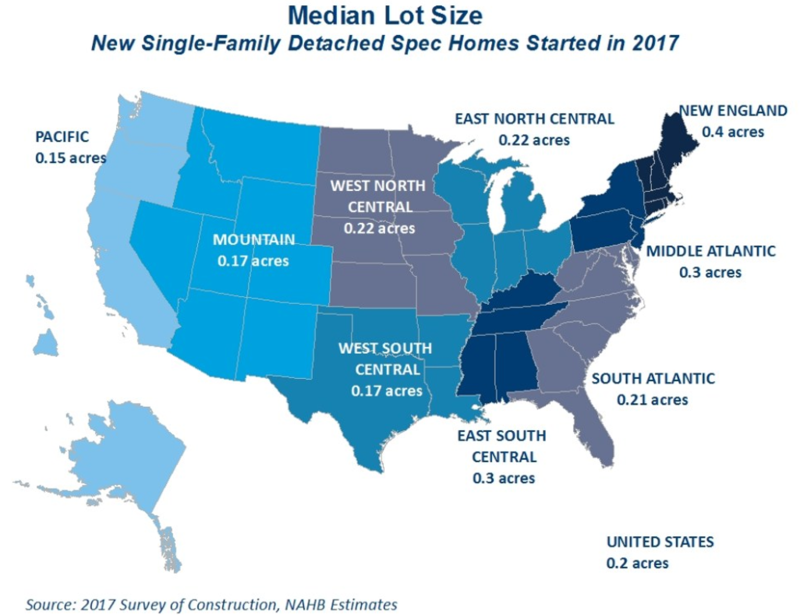 The National Association of Home Builders has dug into the numbers some and highlighted trends for both the lot size and lot values across the country for new single-family construction. In the big picture, the typical lot size has been declining for some time, while lot prices on an inflation-adjusted basis remain steady. However there is a lot of variation underneath these figures, so I thought I’d dive in as well. First, a NAHB map showing how the typical lot size for new construction varies across the different Census divisions (the lowest level of geography for which data is available). 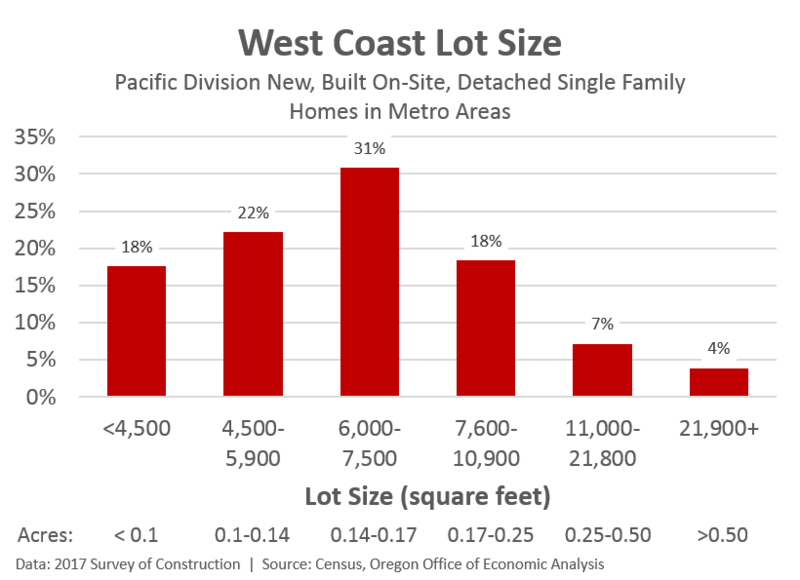 The Pacific Division has the smallest lot size at 0.15 acres which is roughly 6,500 square feet. Depending upon where you live here in Oregon a 6,500 square foot lot is either pretty big, fairly typical, or even small. For example, the classic single family parcel in the City of Portland is 5,000 square feet, and the most common residential zoning in the City of Bend, and City of Salem call for 4,000 square feet. That said, Beaverton has a lot of 5,000 and 7,000 square foot lots, Medford is primarily 7,000 and 10,000 square foot lots, while Lake Oswego has mostly 7,500, 10,000, and 15,000 square foot lots. Rarely are homes built on larger parcels than these, both due to development codes and the fact that most new construction takes place in urban areas, or on the urban fringe. New construction in rural areas tends to be on larger lots — measured in acres, not tenths of acres — but represents a small share of overall construction activity. 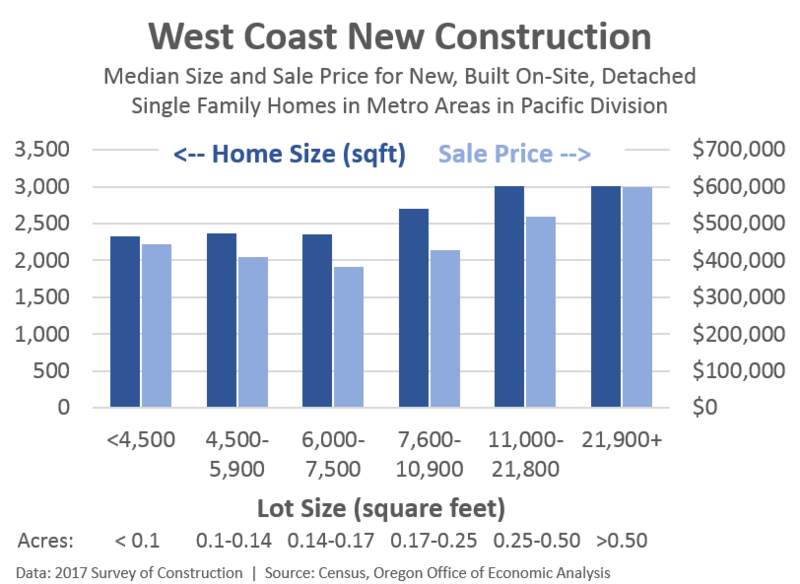 In terms of how big these new homes are and how much they cost, there is somewhat of a pattern based on lot size. Generally speaking, with a larger lot, a bigger home is built, and the sale price is higher as a result. However when it comes to the small and medium-sized lots, there is less variation in the size of homes built and their sale price. There are quite a few things going on here that we are not able to untangle with this particular data set. In the least charitable description, one could say developers are taking advantage of the smaller lots, building the same sized house and charging the same amount, or more, and thus reaping higher profits. However, these smaller lots tend to be more centrally located within urban areas where land values are higher due to stronger demand. As such, a more likely explanation would be that by spreading the high land costs across more housing units, builders are able to deliver the same sized house for roughly the same price as those built on somewhat larger lots that are likely less centrally locate. In this sense, smaller lot sizes act to help with affordability.